Take full advantage of your holiday in the Giant Mountains. 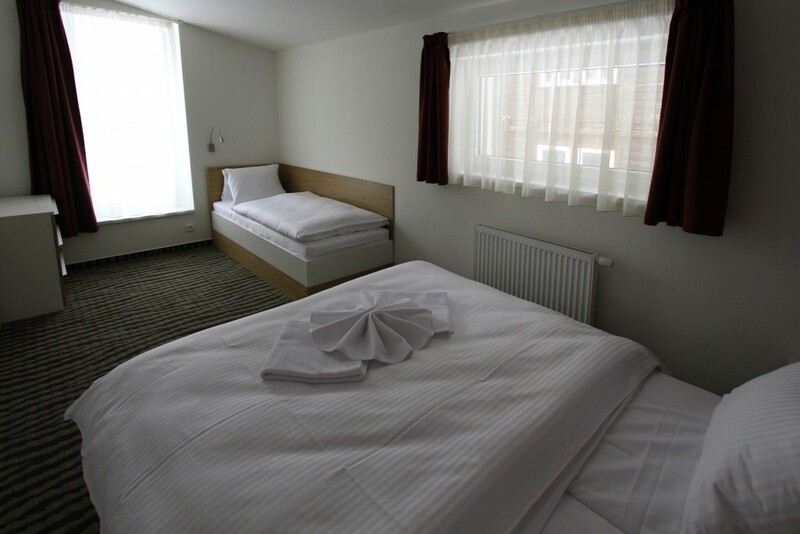 Staying in any of our guest houses ensures yourprivacy, comfort and convenience in our spacious rooms. 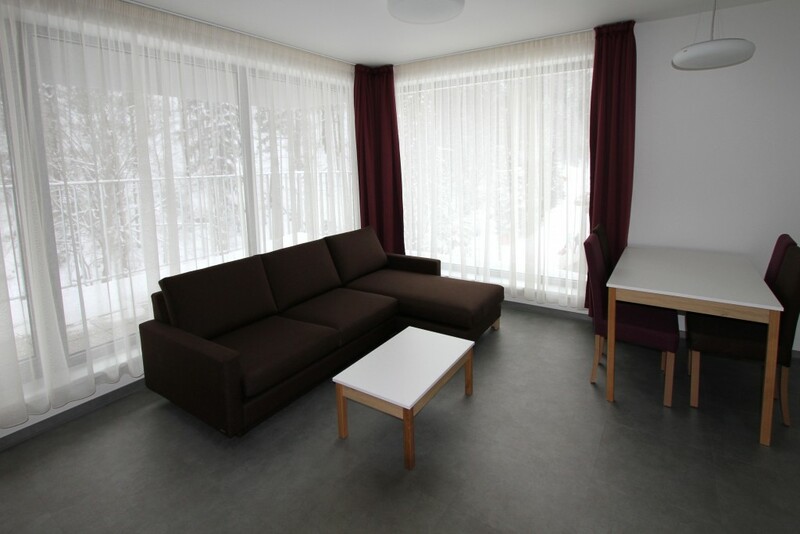 Of course, we also provide ski storage rooms, bicycle rooms, children´s areas and a lobby bar. 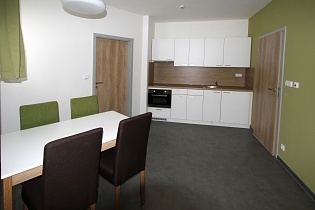 Each apartment features a kitchen and a dining area, which allow you to dine at whatever time suits you. Make yourself at home and relax in the heart of the Giant Mountains. Accommodation and prices of our apartments in Janský Potok I guest house. Discover the magic of a space spanning more than one hundred years now fully renovated, spa building at the foot of Černá Hora. 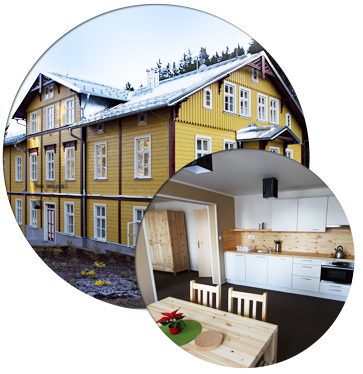 Stay near the centre of Jánské Lázně and soak up the charming atmosphere of our mountain family guest house Janský Potok I. 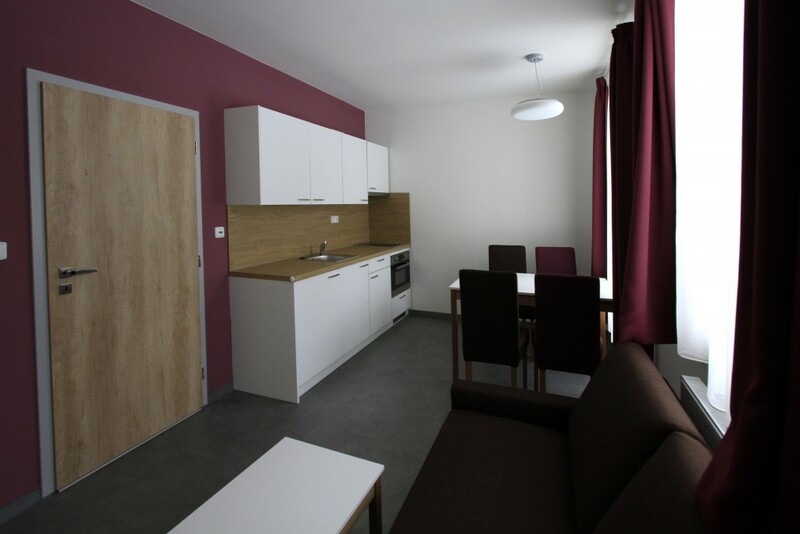 Our cosy apartments, tailored for convenient self-catering, provide our guests with maximum comfort and privacy. 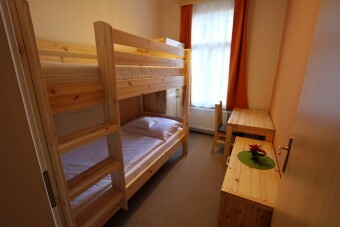 Accommodation and prices of our apartments in Janský Potok II guest house. Soak up the atmosphere of modern architecture in the centre of a small spa town. For you convenience there are spacious rooms, a playroom and a conference hall,too. Our guest house also features a café, where you can enjoy a cup of delicious coffee and sample our homemade desserts. The ski room provides heated lockers for your ski boots. 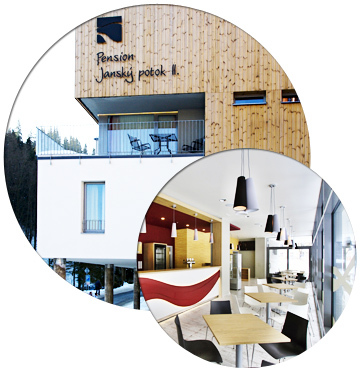 The nearest ski slope can be reached by local ski bus in 1 minute and the local spa is just a 50 metres walk. Whether on a business trip or holiday, your stay at our stylish guest house will be luxuriously hassle-free. 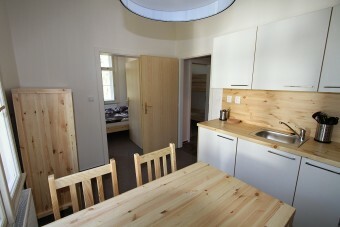 What does our double bed apartment with disabled access look like? Our wheelchair/pram friendly apartment will comfortably accommodate two guests. 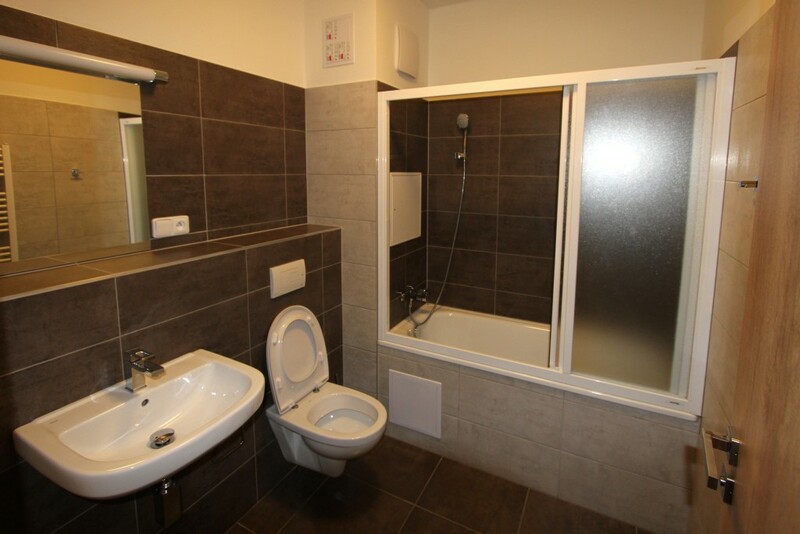 All amenities including a bathroom with a shower and a kitchen are designed to ensure an unrestricted convenient stay to disabled people and their attendants. 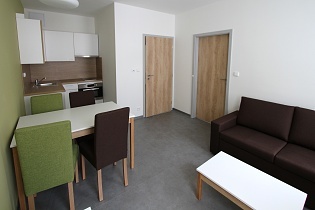 All apartments are furnished in a unified style. 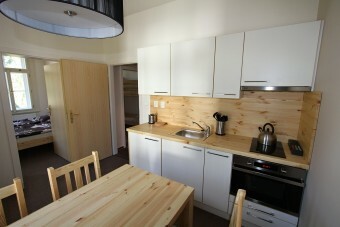 The modern fully equipped kitchen features an oven, induction hob, microwave oven, and other kitchen utensils. For you absolute comfort, there is also a television. Each apartment offers ample storage space. Wi-Fi is available on all the premises. 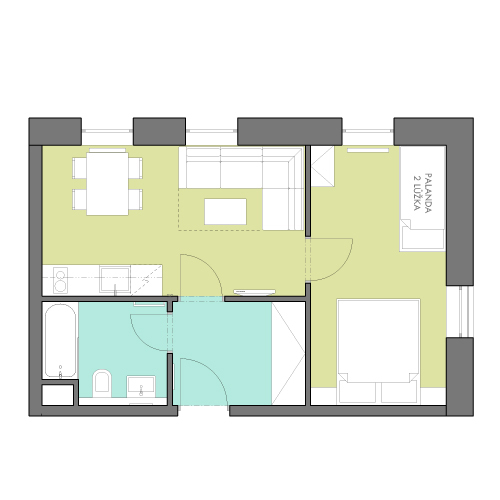 What does our two bed apartment look like? 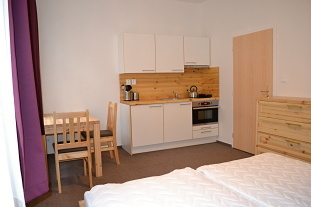 Our cosy apartment for two guests conveniently accommodates a couple or a few of friends. This apartment features a bedroom, a private kitchen including a dining area and a bathroom with a bath. All apartments are furnished in a unified style. The modern fully equipped kitchen features an oven, induction hob, microwave oven and other kitchen utensils. For your convenience, there is also a television. Each apartment offers ample storage space. Wi-Fi is available on all the premises. 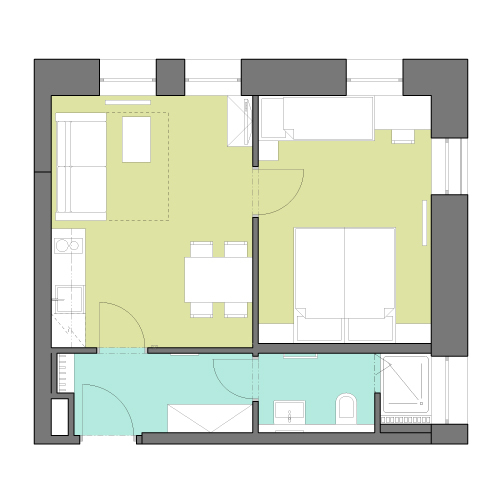 What does our three bed apartment look like? 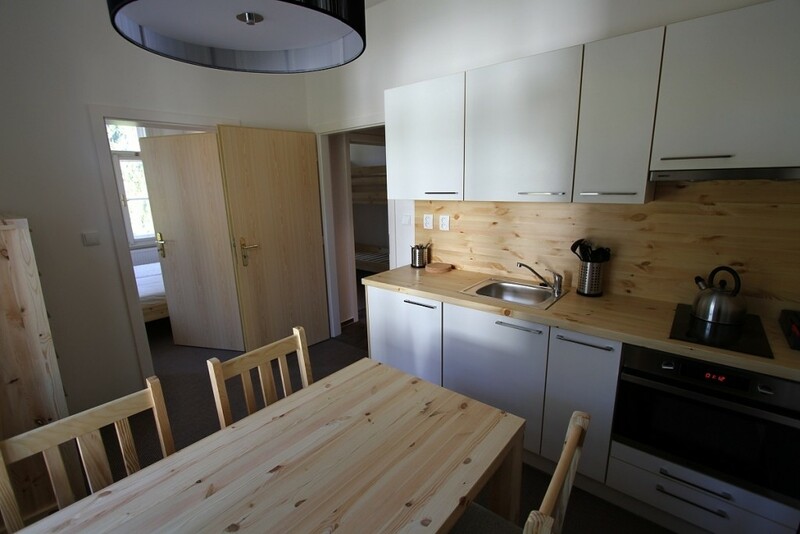 Our stylishly furnished apartment for three guests features a cosybedroom with plenty of space,a living room with a television,a private kitchenincludinga dining area and a bathroom with a shower. This apartment is ideal especially for a smaller family or a group of friends. All apartments are furnished in a unified style. 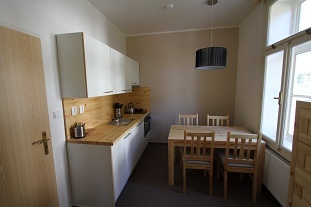 The modern fully equipped kitchen features an oven, induction hob, microwave oven and other kitchen utensils. 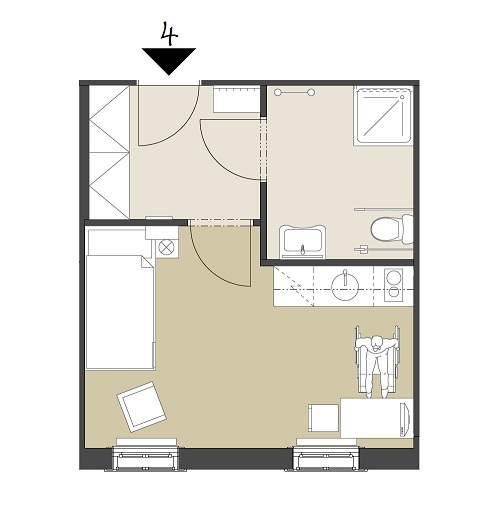 Each apartment offers ample storage space. Wi-Fi is available on all the premises. 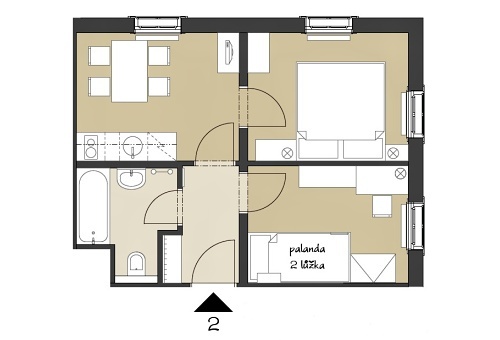 What does our four bed apartment look like? 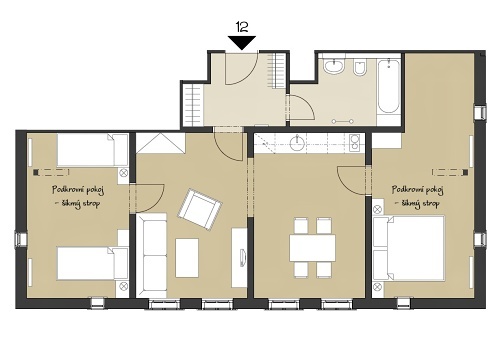 Our 1-bedroom apartment for four guests features one bedroom with a double bed and a bunk bed, a private kitchen including a dining area and a television and a bathroom. Accommodation in this apartment is suitable especially for families with children or a smaller group of friends. 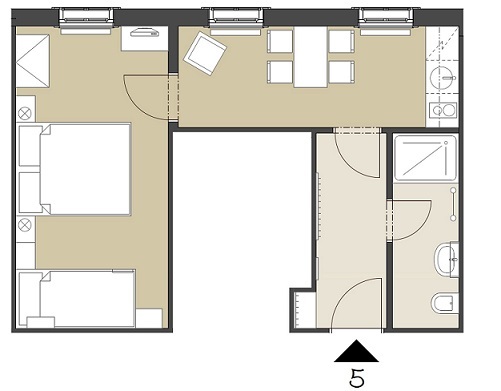 What does our comfort four bed apartment look like? a a bathroom with a shower or a bath. 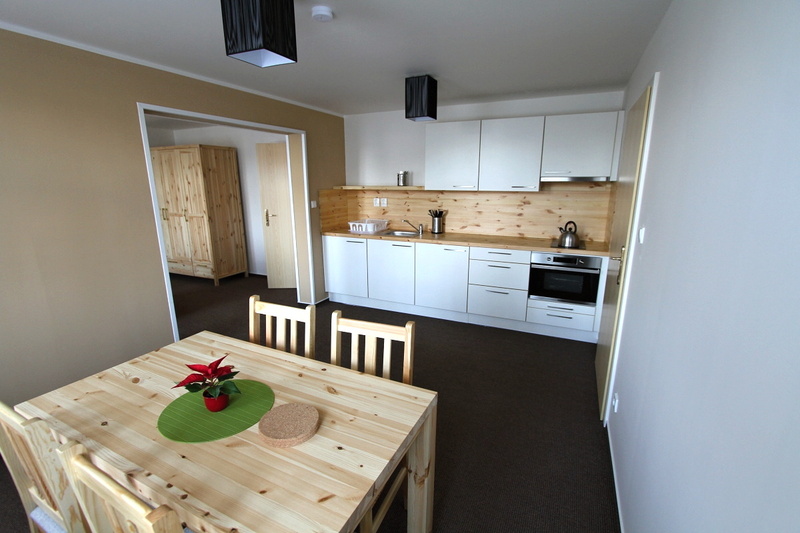 The apartment is ideal for families with children or a group of friends. 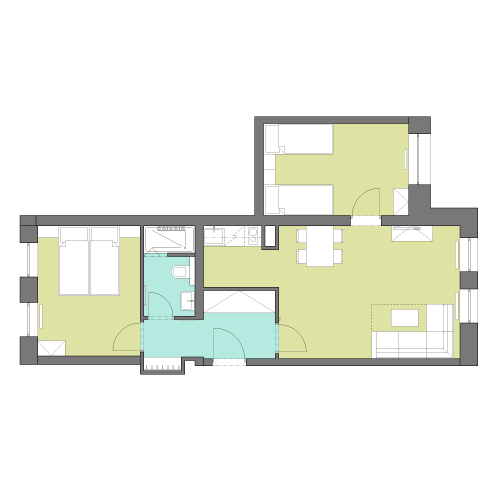 What does our large four bed apartment look like? 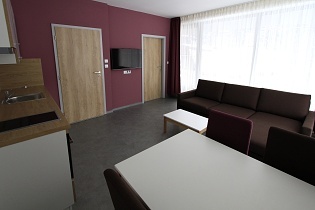 Our comfortable apartment for four guests features two nice and cosy bedrooms, a spacious living room with a television, a private kitchen including a dining area and a bathroom with a bath. 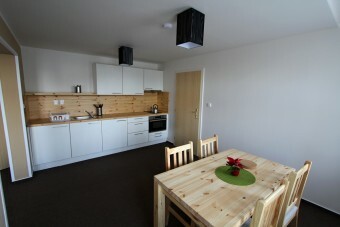 Accommodation in this apartment is suitable especially for families with children or a smaller group of friends. 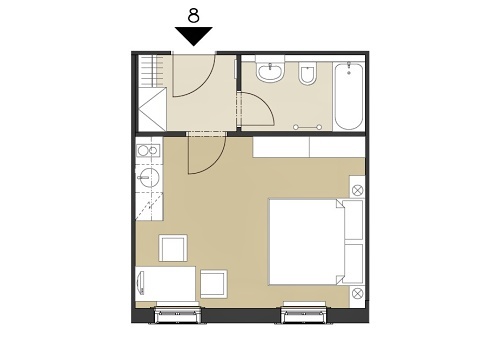 What does our six bed apartment look like? Our comfortable apartment for six guests features two nice and cosy bedrooms, a spacious living room with a television, a private kitchen including a dining areaand a bathroom with a bath. 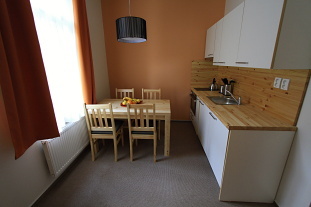 Accommodation in this apartment is suitable especially for larger families with children or a group of friends. What does our double bed apartment look like? Our cosy apartment for two people i comfortably accommodates couples or a few friends. 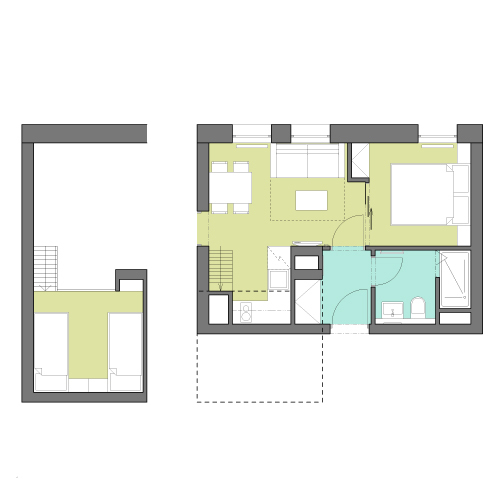 This apartment features a bedroom, a private kitchen including a dining area and a bathroom with a bath. 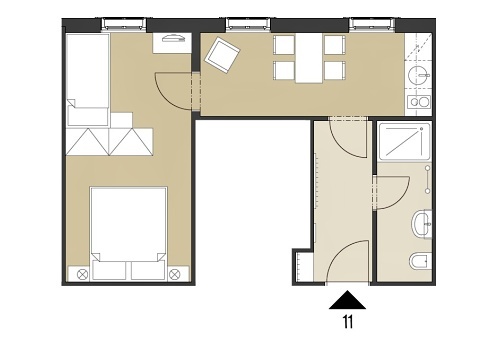 There is also an elevated floor where another two guests may be accommodated if required. 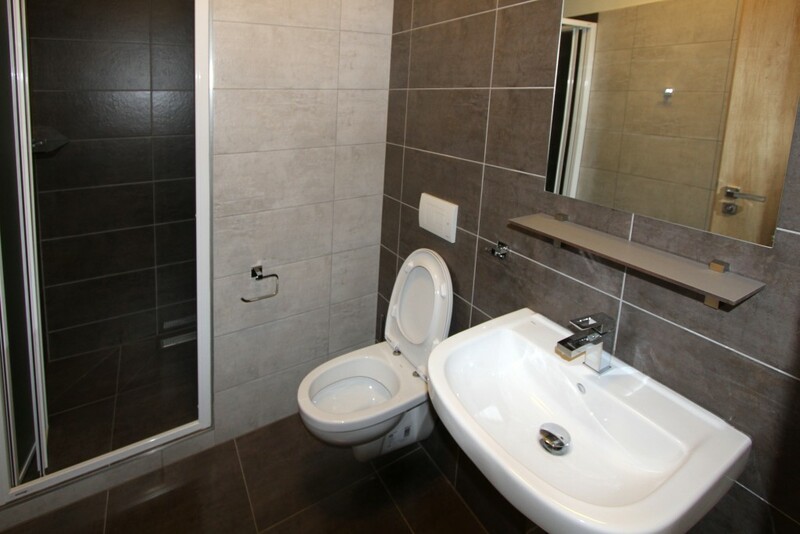 All apartments are furnished in a unified style. The modern fully equipped kitchen features an oven, induction hob, microwave oven and other kitchen utensils. For your absolute convenience, there is also a television. Each apartment offers ample storage space. Wi-Fi is available on all the premises. 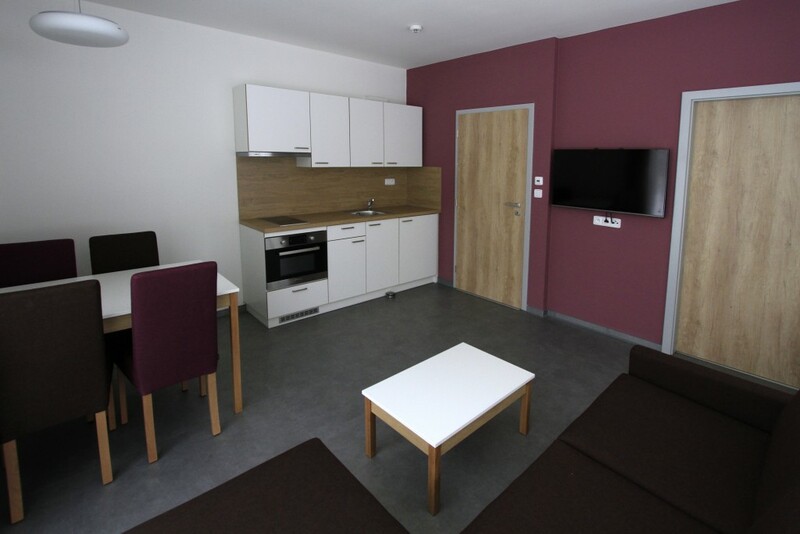 Our stylish apartment for four guests features a spacious bedroom with a double bed and a bunk bed, a private kitchen including a dining area and a television and a bathroom with a shower or a bath. 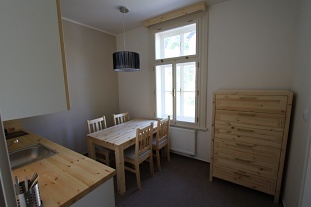 The apartment is ideal for families with children or a small group of friends. 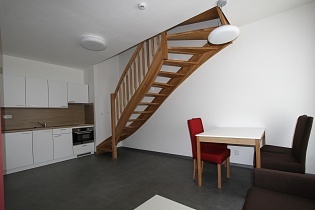 All apartments are furnished in a unified style. The modern fully equipped kitchen features an oven, induction hob, microwave oven, and other kitchen utensils. Each apartment offers ample storage space. Wi-Fi is available on all the premises. 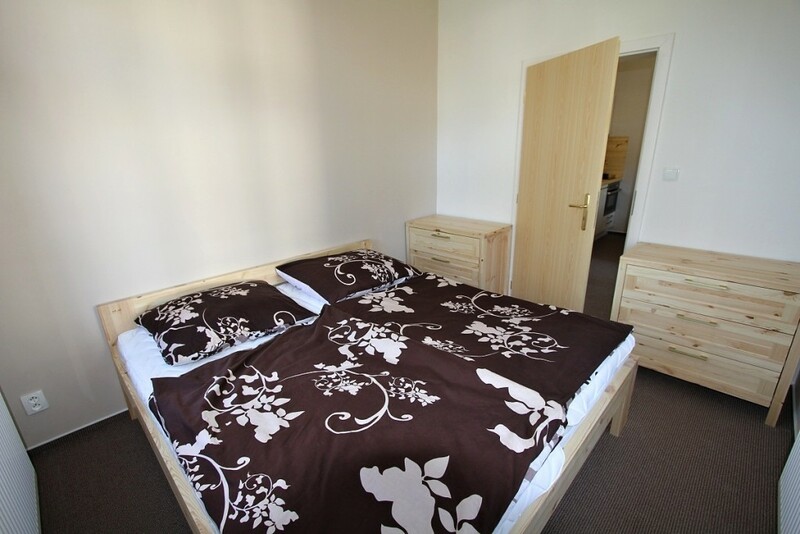 What does our comfortable four bed apartment look like? 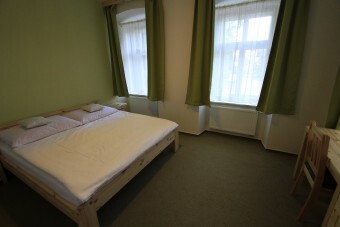 Our apartment for four guests features two nice and cosy bedrooms. In the first one, there is a double bed and in the second one, there are either bunk beds or two single beds. 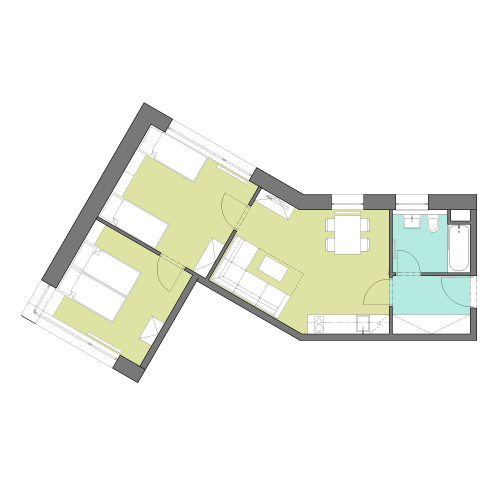 An integral part of this apartment is formed by a large living room with a television, a private kitchen including a dining room and a bathroom with a bath. 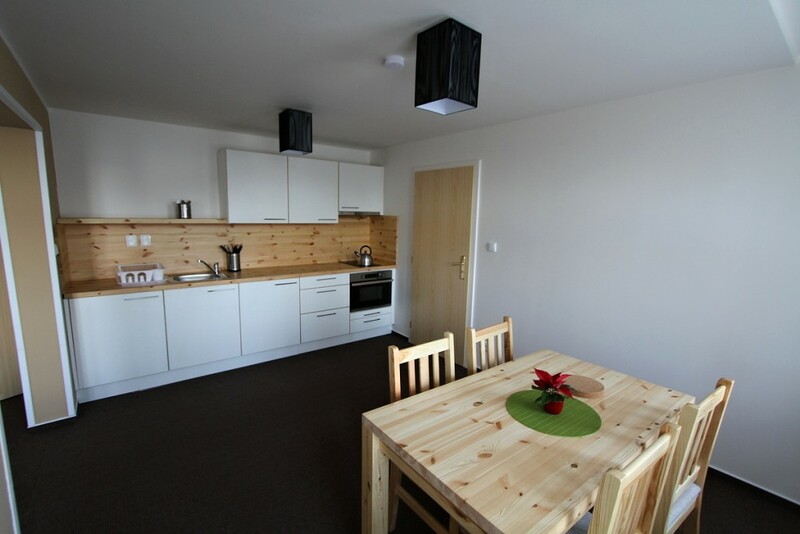 Accommodation in this apartment is especially suitable for families with children or a smaller group of friends. 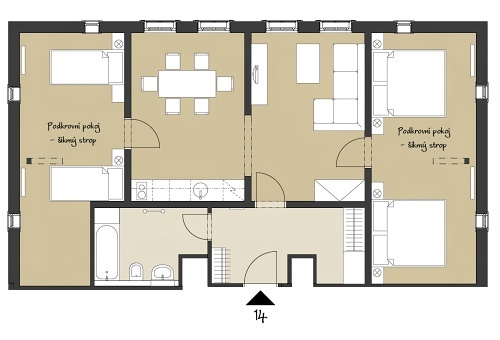 What does our large superior four bed apartment look like? Our superior apartment for four guests features two nice and cosy bedrooms, a spacious living room with a television, a private kitchen including a dining area and <spanclass="vyrazny">a bathroom with a spacious shower. Accommodation in this apartment is especially suitable for families with children or a smaller group of friends. Two of our apartments are complemented with a spacious terrace, more than 15 metres large,² ideal for taking a pleasant break in the fresh mountain air. Accommodation costs can also be paid for as an indirect order from an employee benefit programme (such as Benefit Plus). Our premises and also the apartments arenon-smoking. To maintain a quiet settingpets are not allowed . Accommodation does not include meals. Our guests may prepare their own meals or alternatively they may dine in restaurants nearby (just 50 - 200 metres from the guest house). 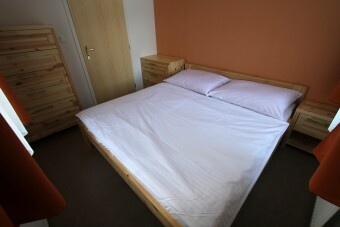 After receiving your order we will promptly contact you and send you specific information regarding your accommodation. An advance reservation fee will be charged at 50% of the price for the stay; the remaining amount will be due upon arrival.